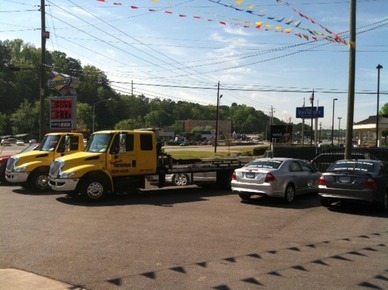 Vestavia Tire Express is the official towing service for the city of Vestavia Hills, Alabama. We can safely transport vehicles after breakdown, accident, arrest, or any other incident throughout the city. We provide limited roadside assistance with our towing services. If you physically can’t change your tire, your spare is flat, or there are complications – call us for safe and reliable service. Lug nuts that are stripped or improperly tightened need to be removed by a professional with the right tools. If your spare tire isn’t checked regularly when you perform car maintenance, it may be an unpleasant surprise when you are in need. We can easily remove the affected tire, ensure your spare is at the recommended PSI, and even find you a reliable used tire for replacement at our shop. Be prepared: keep a change of clothes, flashlight, hand cleaner, paper towels, tire gauge, and other tools in your trunk. Drive to a safe location if possible. You need to be level and on a solid surface in order to jack up your car. Turn on your emergency flashers, give plenty of room between you and the road, set your parking brake and make sure your car is in park or in gear. 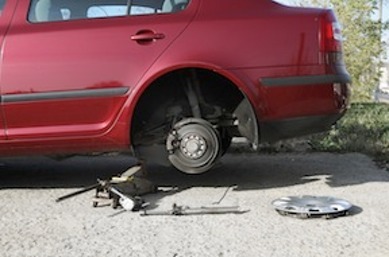 Check your spare and tools, remove the hubcap or wheel cover, and loosen the lug nuts. For extra comfort, sit on an upside down floor mat so your clothes aren’t dirtied. Properly position the jack and raise the vehicle, remove the tire, and mount the spare. Finger tighten the lug nuts and lower the the vehicle. Tighten the lug nuts, remove the jack, stow the flat in your trunk. Head to Vestavia Tire Express for expert tire repair. And if you don’t want to change it yourself – CALL US! Our roadside assistance also includes jumping off dead batteries, helping when you are out of gas, and if your car simply won’t start. Our services are affordable and quick to get you back on the road as soon as possible. When a vehicle is towed after an accident, arrest, or suspended or revoked license it can be released to the driver at our location. Towed vehicles must have release forms supplied by the Vestavia Hills Police Department and then may be picked up at Vestavia Tire Express between 8:00AM until 4:30PM Monday through Friday. Further information for proper forms needed to release a towed vehicle may be obtained from the official website of Vestavia Hills.